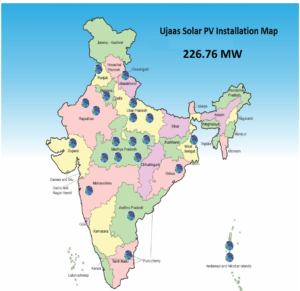 Ujaas™ Park, is a product which provides a complete turnkey solution for investors who want to become a solar power producer “under REC/ Preferential tariff/ APPC/ Captive etc. Mechanism” It is an opportunity to our investors to setup their own solar power producing units in our fully developed Solar Parks. These plants are available for the customers after they are fully operational and start feeding power to the grid. We provide all the required services for the customers and investors to make them a successful power producer. The plant size ranges from minimum of 500 KW to several MWs. We have successfully established solar parks with capacities of more than 100 MW and are all set to take up bigger challenges. With years of experience and expertise we ensure flawless operation for your installed systems in our solar parks. Further we enter into an O & M contract for next 20 years for operation & maintenance of the plant, which does not stop here but also include all the procedure till issuance of REC along with billing adjustment of power sale till realization of proceeds. Solar projects come under 80(IA) which says that income generated from sale of power is exempted from IT for continuous 10 years in block of initial 15 years from the date of commissioning. You make Mother Earth happy by contributing in reducing Carbon footprint and join your hands with world around to fight Global Warming.